Choose a page number or click on one of the topics below. A lavish introduction to 35 of the world’s best-known, best-loved paintings. Includes the Mona Lisa, Girl with a Pearl Earring, Van Gogh’s Sunflowers and The Scream. Simple and engaging text gives fascinating information about each painting, artist and art style. Beautifully presented with fabulous reproductions of the paintings and internet links to websites to find out more. This is a fascinating and eye-catching book. 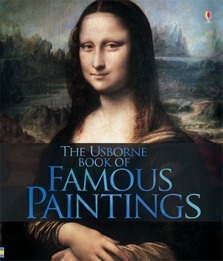 It explains about paintings and artists but the facts are written in a fun way. It is suitable for ages 8-100! I really like this book because it's very informative and it is written in a friendly manner so you enjoy reading it. This book is an excellent choice for people interested in the history of art.